In a large pot, heat the oil over moderately low heat. Add the onion and cook, stirring occasionally, until translucent, about 5 minutes. Increase the heat to moderately high. Add the mushrooms and cook, stirring occasionally, until golden, about 5 minutes. Stir in the garlic and the soy sauce. Add the lentils, salt, and water to the pot. Bring to a boil. 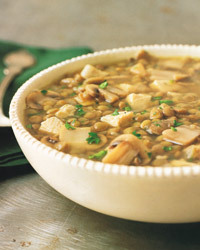 Reduce the heat and simmer, partially covered, stirring occasionally, until the lentils are tender, 25 to 30 minutes. Stir the turkey, pepper, and 1/4 cup of the parsley into the soup. Top each serving with some of the remaining 1 1/2 tablespoons parsley. Variations Try two cups of diced cooked chicken or ham instead of the turkey. Zinfandel is the one truly American red, so why not serve it with our native bird? It's more than poetic license: Turkey's strong, gamy flavor, and the earthy lentils as well, requires a robust and fruity wine.